Above: A girl works on a drawing next to an unused viewing scope as a smoky haze obscures the Space Needle and downtown Seattle behind, Tuesday, Aug. 14, 2018. Public-health officials are warning of unhealthy air across parts of the Pacific Northwest as smoke from wildfires move across the region. (AP Photo/Elaine Thompson). 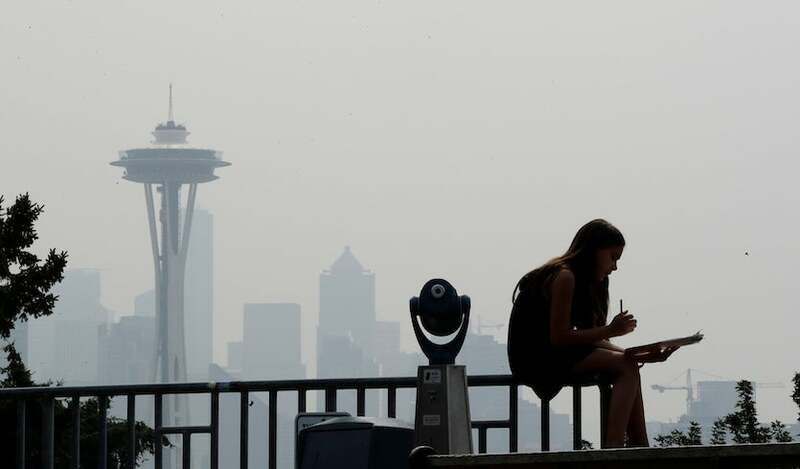 Smoke from the wildfires raging in southwestern Canada and the Northwest U.S. have brought Seattle and much of Washington State their worst PM2.5 air pollution in the past twenty years over the past few days. At Seattle’s 4103 Beacon Hill S monitoring site, 24-hour-average fine particle pollution (PM2.5) levels hit 57.3 μg/m3 on August 14. That’s well in excess of the EPA standard of 35 μg/m3, and is the highest PM2.5 level ever measured at the site, in EPA records that extend back to 1999. The pollution fell in the red “Unhealthy” Air Quality Index (AQI) range, which the EPA warns can cause “increased aggravation of heart or lung disease and premature mortality in persons with cardiopulmonary disease and the elderly; increased respiratory effects in general population.” At Seattle’s Duwamish monitoring site at 4700 E Marginal Way, PM2.5 levels of 55.4 μg/m3 were measured on August 14, which ranked as the second highest PM2.5 reading of the past twenty years; a slightly higher value of 57.6 μg/m3 was measured on August 3, 2017, during another smoke episode. PM2.5 (particles that are less than 2.5 microns or 0.0001 inch in diameter)—is the most deadly form of air pollution, and causes over 80,000 premature deaths each year in the U.S. In Central Washington, smoke levels have been even more concentrated over the past few days, with a monitoring site in Chelan recording PM2.5 levels of 177.9 μg/m3 on August 15, 171.4 μg/m3 on August 11, and 160.8 μg/m3 on August 14. Another monitoring site in Wenatchee recorded 165 μg/m3 on August 14 and August 15. Those values fall in the purple “Very Unhealthy” Air Quality Index (AQI) range, which the EPA warns can cause “Significant aggravation of heart or lung disease and premature mortality in persons with cardiopulmonary disease and the elderly; significant increase in respiratory effects in general population.” In records going back to 1999, these are the highest PM2.5 levels ever observed at these sites. They were also the highest values recorded in the entire state of Washington over the past twenty years, with the exception of a smoke episode that affected eastern Washington in the Yakima and Spokane region during August and September of 2017. A blog post by Cliff Mass of the University of Washington on August 15 outlined the meteorology behind the Seattle’s air pollution woes—a high pressure system set up to the northeast of the city, and the clockwise flow of air around the high brought smoke from fires burning in British Columbia and eastern Washington into central and western Washington. In addition, high pressure aloft amplified to the west of Seattle, causing sinking air and creating a subsidence inversion from the surface up to about 3000 feet. In an inversion, the temperature increases with height, creating a stable atmospheric lid, preventing the smoke from mixing out during the day. Onshore westerly winds began blowing again on Wednesday evening along the west coast of Washington, and these winds will act to slowly flush the pollution out over the next few days. However, near-record high levels of PM2.5 are likely again on Thursday in portions of eastern Washington. While this week’s air pollution episode is the worst in Seattle in the past twenty years, Seattle had much worse air quality in several winters during the 1980s. As detailed in an article at komonews.com, air pollution regulations were more lax at that time, allowing higher emissions by cars, utilities, industry and dirty wood burning stoves. In winter, these higher emissions were trapped by inversions, allowing PM2.5 levels to soar above this week’s levels on numerous occasions in 1982, 1983, and 1985. We'll have an update on Invest 99L, which is headed towards the Lesser Antilles Islands, later today. Bob Henson contributed to this post.